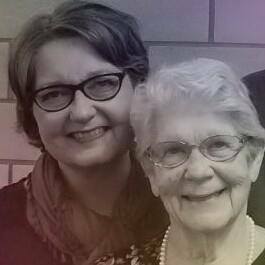 My mom, Phyllis, passed away at age 88 on March 4. As I’ve celebrated her life and am grieving her loss I’d love to share three things about her and the resulting coaching questions that she inspires. These stories and questions make me smile and I hope as you read you can smile too! My mom at age 88 walked two miles every day. If the weather prevented her from walking outside, she would walk at a shopping mall or the community center. She wore a Fitbit and tracked her steps every day, her goal being 10,000 steps. At her funeral a cousin asked, “did she really walk two miles every day?” Yes, she did! And as a result she kept herself active and inspired others. When my mom was 65 she received her Master’s degree from Bethel University. Christian Education had been her life’s work and ministry, but getting a grad school education and degree in the area was something she wanted and she went for it. Her age did not hold her back. Two years ago, I accompanied her to Boston as she joined eight of her classmates for the 65th reunion of her undergrad class at Gordon College. She joined eight of her wise and energetic classmates for a joyful celebration of connection and long life. Mom was looking forward to going back to Boston for her 70th reunion – although I’m sure the alternative of a reunion with many more of her classmates in heaven was much more wonderful. At my mom’s visitation and memorial service and in the cards and messages we received we clearly saw her legacy. Yes, she did some impressive work in her career and ministry that had high impact on people’s lives. But it was her endless supply of encouragement given in her day-to-day relationships that we heard the most about as people shared memories. The cards, smiles and greetings she gave. And the hugs. I hadn’t fully recognized how important this was to people until after her death we received so many references to her treasured hugs. She gave them freely to all who were open. What a sweet legacy! Linda, my sympathies and condolences on the loss of your mother. Even when we have the assurance of our dear one’s place and peace in God’s presence, there is still grief. Thank you for acknowledging this as well as how grief effects motivation and energy, even with the things we have a passion for. That’s so normal and yet comes as a surprise to many. Praying for you as you travel this season. My journey after my Mom died was probably the hardest I’ve had to travel through, but the grace that carried me through it was immense and profound. Thank you for your encouragement, Donna. Thanks for sharing your personal story, too. Comment Such a nice tribute to your mom, Linda!! She left a hole on earth but am so happy for her now and I know you are too!! Yes, I am Adele! Thank you. Thanks for inspiring us with your mom’s amazing life, full of energy, offering high impact and warm encouragement to everyone around her. And thanks Linda, for modeling such strong legacy for all of us here. Wish you and Rayna a lovely Mother’s Day weekend! Thank you for your kind comments, Winnie. Happy Mother’s Day to you as well!